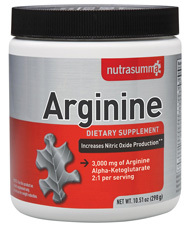 NutraSumma® Arginine provides an effective two-pronged supplement for high intensity work-outs. L-arginine and antioxidant Vitamin C. One helps vessels relax while the other is a super antioxidant. 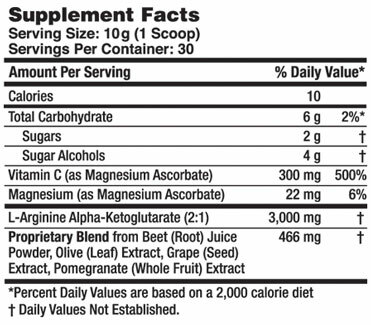 L-arginine - bound AKG - is a more stable form of this conditionally essential amino acid. The body uses it to make nitric oxide which relaxes vessels and eases blood flow to the muscles. Vitamin C - as magnesium ascorbate, is at the ready to combat free radicals produced in the blood when muscles are under intense exercise stress. Other Ingredients: Erythritol, organic cane sugar, xylitol, stevio glycosides, silicon dioxide. Suggested Use: One scoop (10 g) with 4-6 fl oz of water or your favorite beverage, preferably apart from high-protein meals, or as directed by your healthcare provider. NutraSumma Arginine works to increase exercise production through the increase of blood flow to the heart and muscles. Includes free radical removing antioxidants.